Analysis of the field events in the women's athletics programme. 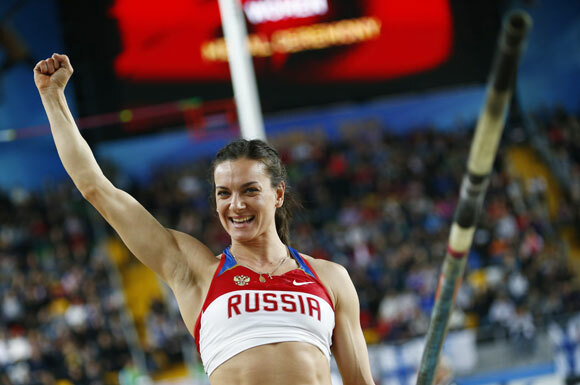 Twice Olympic champion Yelena Isinbayeva has been the dominant athlete. But in the past two years chinks have appeared in her previously impenetrable armour offering hope to medal rivals Jennifer Suhr of the U.S, Germany's Silke Spiegelburg and Brazilian world gold medallist Fabiana Murer. Isinbayeva, 30, set an indoor world record of 5.01 metres (16.44 feet) in February and declared herself still hungry for victory after winning the world indoor title. But the Russian has had an outdoor season to forget. She failed to register a height at the Monaco Diamond League meeting having delayed the start of her outdoor season to work on her technique. In the meantime, Suhr has the best height of the year with 4.83 metres and Murer (4.82) has won the Diamond League meetings in Eugene and New York. British hopes lie with 20-year-old Holly Bleasdale who surprised everyone by clearing 4.87 metres indoors at the beginning of 2012, a height only surpassed Isinbayeva and Suhr this year. The three favourites for gold in London are Britain's Jessica Ennis, Ukraine's defending Olympic champion Nataliya Dobrynska and Beijing bronze medallist Russian Tatyana Chernova. Home hope and 2009 world and 2011 European champion Ennis, who missed the Beijing Olympics through injury, is the world leader this year but lost to Russia's Chernova at last year's world championships in Daegu. Dobrynska's outdoor season was put on hold following the death of husband and coach Dmytro Polyakov shortly after her World indoor Pentathlon title in Istanbul in March. Beijing silver medallist, American Hyleas Fountain, won her Olympic trials, but is only an outside bet for a medal. Germany's world record holder Betty Heidler is only the third best woman this year, ranked behind Belarus's Olympic champion Oksana Menkova and world gold medallist Tatyana Lysenko of Russia who returned from a two-year doping ban in 2009. World champion Anna Chicherova is ranked number one in the event this year with a top height of 2.03 metres (6.66 feet), closely followed by Daegu silver medallist Chaunte Lowe, who has been beaten only once outdoors this season - in Eugene, Oregon, where she finished third behind her Russian rival. American Amy Acuff, 36, is competing at her fifth Olympics, with a best placing of fourth in 2004. Croatia's former world champion Blanka Vlasic is absent after having surgery on her ankle and heel this year. World indoor and outdoor champion Brittney Reese has the two furthest jumps of the year and heads a strong U.S contingent of Janay DeLoach and Chelsea Hayes. Nigerian Blessing Okagbare has made more of an impact over the 100 metres this season, which she is also scheduled to run in London, but has a chance of adding to her long jump bronze from four years ago. Last year's world championship podium was made up of Ukraine's Olha Saladuha, Kazakh Olga Rypakova and Caterine Ibarguen of Colombia and the Olympic medals could well go to the same trio. 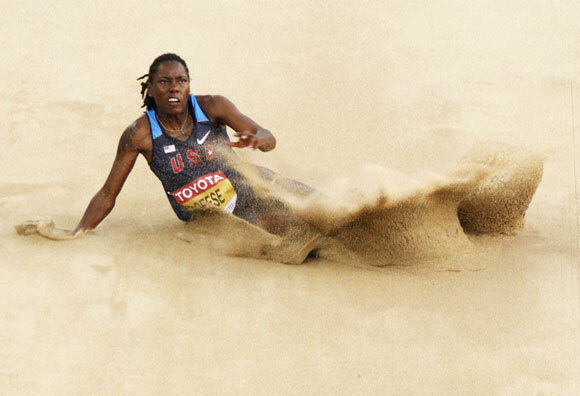 Saladuha and Ibarguen have the four furthest jumps of the year between them while former heptathlete and long jumper Rypakova heads the Diamond League standings for the season having finished in the top three in all four of her meetings. 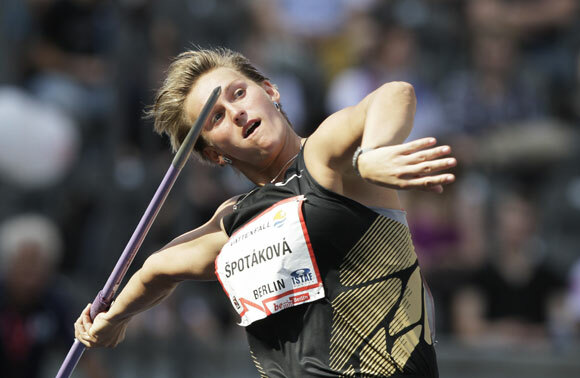 Czech world record holder and Olympic champion Barbora Spotokova has been on the podium at every major championship since 2006 so you would not bet against her winning a medal in London. South African Sunette Viljoen has the furthest throw of 2012 setting a personal best of 69.35 metres (228.12 feet) in June. Christina Obergfoll of Germany and Russian world champion Mariya Abakumova are also likely to be challenging for the top three. Britain's Goldie Sayers set a national record of 66.17 metres this month boosting the hosts' outside chance of a medal but she comes into the competition nursing an elbow problem. Russian Darya Pishchalnikova, who served a two-year ban for doping from 2007, produced the furthest distance since 1992 when she threw a stunning 70.69 metres (232 feet) earlier this month. Germany's world silver medallist Nadine Muller is the next best in 2012 with 68.89 metres. Sandra Perkovic of Croatia returned from a six-month drugs ban this season and threw a personal best of 68.24 metres while Cuba's Olympic silver medallist Yarelis Barrios has also gone over 68.00 metres. The battle for gold will almost certainly be between New Zealand's world and Olympic champion Valerie Adams and her great rival Nadezhda Ostapchuk of Belarus. 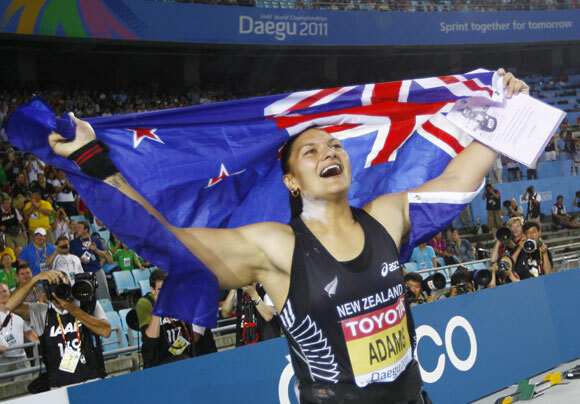 Adams, 27, has come out on top in major competitions recently, beating Ostapchuk to the world indoor title in March and at last year's outdoor championships. However, the bronze medallist from four years ago has the three furthest throws in 2012 and set a personal best earlier this month.